You are here: Home › Featured › North Cascades › Magic of Winter in Leavenworth Washington! 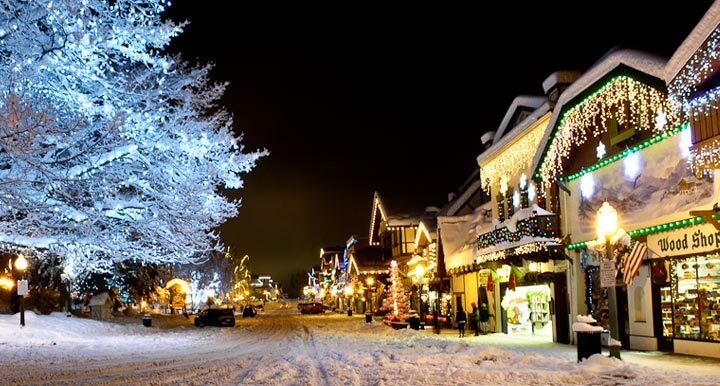 Winter Magic in Leavenworth Washington! With winter upon us it’s time to think about getting out and enjoying winter activities. You might think about a trip to Utah, Colorado, British Columbia, or California destinations for your winter vacation, or this winter plan on visiting the charming Bavarian Village and spend some of your winter in Leavenworth in the heart of Washington State. 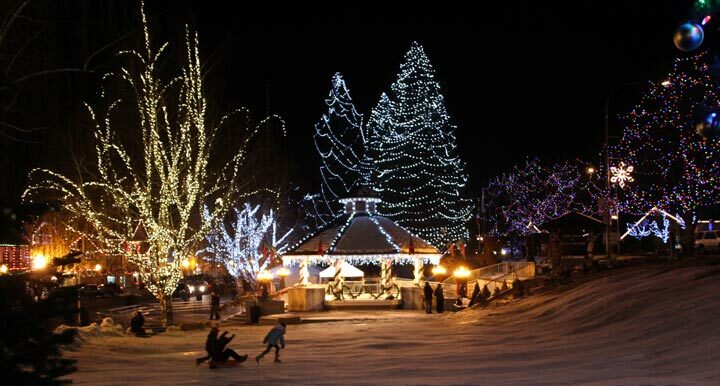 Well known for the Bavarian theme and for its festivals like the annual Christmas Lighting Festival and Icefest, many people don’t realize that Leavenworth is also home to an incredible array of winter activities and recreation. Skiing and snowboarding, Nordic skiing, ski jumping, sleigh rides, snowmobile tours, snow tubing, romantic getaways, spa treatments and limousine wine tours are just some of the activities that piggyback onto the great shopping and dining available in this Bavarian base camp! Located on the crest of the Cascade Range, Stevens Pass receives abundant and frequent snowfall as cool air drifts from the eastern slope of the range through the ski area. This keeps the snow relatively dry over their 1,125 acres of ski-able terrain. The Base area elevation is 4,061’ with the top elevation at 5,845’. Night skiing is usually open 5 nights per week. 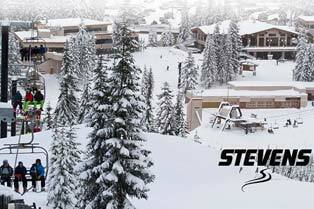 Check their website at www.stevenspass.com for conditions and open hours. You can save on Stay and Play ski packages too. 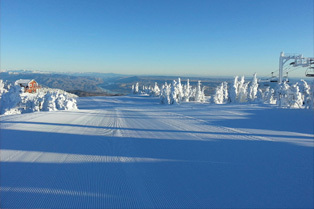 Just visit bestwinterdestination.com to see some of the great lodging that is packaged with Stevens Pass day tickets. Located on the Eastern side of the Cascade Mountains, Mission Ridge is different than other Washington mountains with a combination of over 300 days of sunshine, dry snow and wide open spaces. Over 2,000 acres of terrain wait for you with trails, chutes, screamers and bowls, and a thrilling 2,250 foot vertical drop. The base elevation is 4,570’ with the summit elevation at 6,820’. Mission Ridge is famous for stunning views of the Wenatchee valley and Columbia River from the ski runs, with amazing views of Mt. Rainier from the summit. See www.missionridge.com for conditions and open hours. For families, the Leavenworth Ski Hill located just north of town offers downhill skiing and snowboarding on two groomed hills serviced by rope tows. Check out their terrain park, tubing park with tube lift, and even ski jumping! See skileavenworth.com. 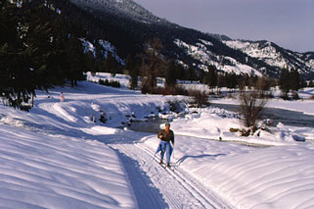 Nordic skiing is a favorite activity in Leavenworth, with World Cup, World Championship and Olympic competitor Torin Koos calling its trails home. Check out the Icicle River trails with 8 km winding through the woods, over bridges, across meadows and along the Icicle River. The Golf Course trails offers 8 km of spectacular views of the Wenatchee River below and the Cascade mountains beyond. The Waterfront Park trails offer 3 km of trails crossing Blackbird Island with views of wildlife, shining waters and connects to the Golf Course Trail. The Ski Hill trails offer 7 km of trails climbing through the forest east of the Alpine Ski Area. Five kilometers is lit for nighttime skiing. Check out the webcams for the local mountains on our Leavenworth webcam page. Snowmobile tours range from 1 hour to 4 hours and start from Mountain Springs Lodge with everything provided: snowmobiles, guide, cold-weather clothing, and insulated boots. A popular snowmobile package includes a gourmet dinner after the tour. Sleigh rides are also available from the lodge. Dog Sledding is a great adventure that you and your family will really enjoy. Local families have teamed up to offer dogsled rides to the public just 30 minutes West of Leavenworth. Together they have over 25 years of experience giving tours and running sled dogs. With teams of Alaskan Malamutes and teams of Alaskan Huskies. You’ll be taken along a 6-8 mile loop on beautiful groomed trails. Each trail offers picturesque natural scenes that will leave you in awe of this winter wonderland. Come visit the dogs with SierraBlu Kennel on the trail for lasting memories this winter! Learn more about all the adventures that await you in Leavenworth, Washington’s Bavarian Village. See Washington State Tours full restaurant guide for Leavenworth with over 50 restaurants and eateries. Check out some of the Wineries and Tasting Rooms.